A drone equipped with a camera, a wireless communication module, an acoustic sensor, a GPS receiver, software and collapsible floatation device patrols above swimmers. The camera and acoustic sensor capture the video and audio of the swimmers. The information is either streamed to a command center or processed by the onboard software. With audio and video analysis capabilities, software is used to detect a swimmer in distress (SID). Alternatively the information is streamed to lifeguard or volunteers all over the world to spot SID. Another detection method is to let swimmer wear a wearable emergency notification device, which sends wireless signals comprising GPS location data. A SID presses a button to indicate rescue request and the drones fly over by GPS signal guidance. Solar power is used as the optional power source of the drones, which would allow the to sustain operation for a prolonged period of time. Once a SID is identified, the drone or drones fly over the SID and drops the collapsible floatation device. 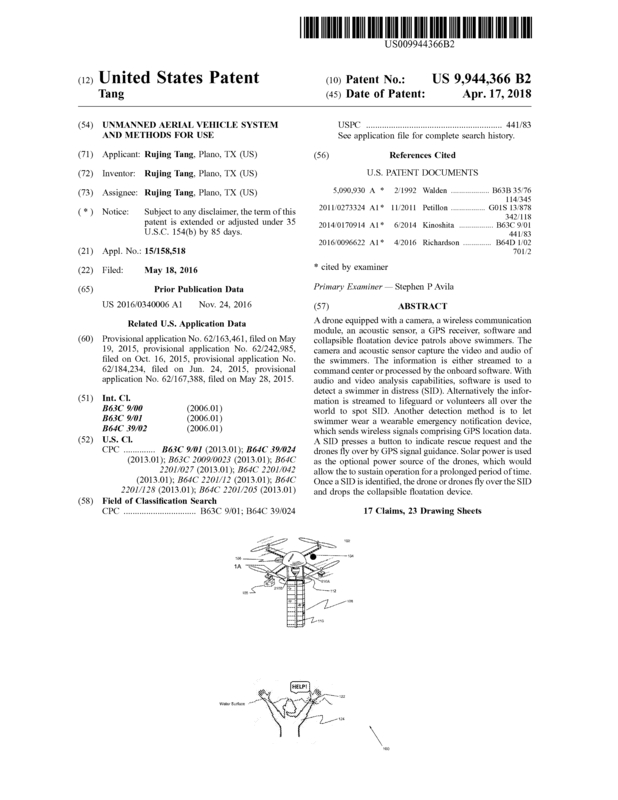 Page created at 2019-04-26 17:47:44, Patent Auction Time.